Mattei Athena at لوور موزه‌سی. Roman copy from the 1st century BC/AD after a Greek original of the 4th century BC, attributed to Cephisodotos or Euphranor. آفینا - یونان میفولوژی یاسیندا مودریک لیک ایلاهه سی. 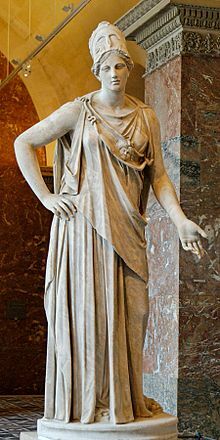 ↑ In other traditions, Athena's father is sometimes listed as Pallas the Gigante, Brontes the Cyclopes, or Itonos the Daktyl. ↑ Kerényi 1951, pp. 121–122. هومر, The Iliad with an English Translation by A.T. Murray, Ph.D. in two volumes. Cambridge, Massachusetts., Harvard University Press; London, William Heinemann, Ltd. 1924. Online version at the Perseus Digital Library. هومر; The Odyssey with an English Translation by A.T. Murray, PH.D. in two volumes. Cambridge, Massachusetts., Harvard University Press; London, William Heinemann, Ltd. 1919. Online version at the Perseus Digital Library. Swiatek, Anthony; Breen, Walter (1981). The Encyclopedia of United States Silver & Gold Commemorative Coins, 1892 to 1954. New York City, New York: Arco Publishing. ISBN 978-0-668-04765-4. ویکی‌آمباردا Athena ایله مربوط فایل وار. بۇ صفحه‌‌ سوْن دفعه ‏۱۲ دسامبر ۲۰۱۸، ‏۲۱:۰۷ تاریخینده دَییشدیریلمیشدیر.